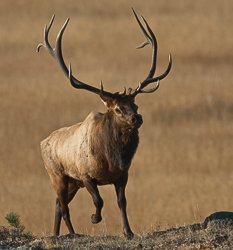 Elk Rut Safaris are a must do trip for any wildlife enthusiast visiting Rocky Mountain National Park between mid September and mid October. Many people come to Estes Park to watch the Elk Rut but few of them really see what is truly going on. Spend an evening with our guide and you will not only watch the rut activity, and hear the bugling of bull elk, but you will also learn to read an Elk's mind through their subtle body language. 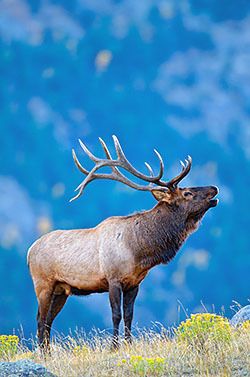 Learn about their behavior, biology, history and survival strategies that makes the elk one of the most majestic animals in the Rockies. 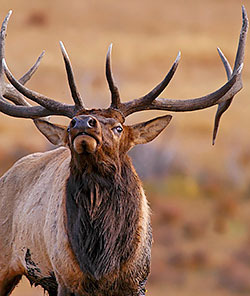 By the end of Elk Rut Safari you will be able to predict exactly when an elk will bugle, tell if a cow elk is interested in a bull or just playing coy, and know where to look to find the next fight between two bulls. Elk Rut Safaris can be combined with a general Wildlife Safari with a chance to see Moose, Big Horn Sheep, Mule Deer, Marmots, Pika, and other small mammals during the morning or early afternoon, and then set up in one of the park's meadows around 4:30pm to start watching the elk action. Only available until Sept 25th for the combined longer tour. Tour Details: All tours are private, only the people you invite will come along. Groups are limited to four people to ensure each person has a quality experience with our naturalist. Limited to children 12 and up. Binoculars are available for each person as well as use of a spotting scope to really bring those distant creatures into view. Be sure to bring a jacket, hat and gloves as the evenings cool off fast as the action gets going. Sunscreen, eco-friendly and optics friendly bug spray, water and healthy snacks are provided for all guests. *Not included: Park entrance fees are $10 per person or $40 for an annual pass.